Outskirts Press, Inc., we take great pride in celebrating the work of our successful self-publishing authors, and we do so each week through our Self-Publishing Author Spotlight. 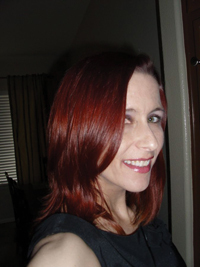 This week we highlight self-publishing author CD Swanson, who has published 17 successful titles with Outskirts Press. Learn more about CD Swanson, her background and how she pours her faith into her published works through this week’s Self-Publishing Author Spotlight. CD Swanson is a Christian with a full proud based belief in God, His son, and the Holy Spirit. Happily married for over 30 years, C D Swanson was in the Social Services field for most of her career – and has always enjoyed writing as a hobby. She admits that her writing ability it is a “gift” from God, and has used it frequently throughout her career, and personal life to encourage and help people in need of love and validation. In addition to her books, CD Swanson has a devotional website, contributes to various magazines, and her prose was selected to accompany a calendar to raise money for childhood cancer. She’s married to her childhood sweetheart and they live with their “boy” on the East Coast. Her degrees are in human services, psychology, and health administration. Have you ever wanted to speak directly to God? Well, words of Praise, through poems – akin to the book of Psalms – is just that, an attempt to Thank Our God, in poetic fashion. Also included are words of thanks, and a personal testimonial bringing about an even deeper confirmation that there is a God above. A Birds Eye Look At An Enduring Friendship That Knew No Bounds, and How it affects The One Left Behind. This book is for anyone who has had a best friend, or someone special in their lives, and lost them. This is a bird’s eye look at an enduring and special friendship, and all the “goofy” things and amazing times shared together, and what happens when one passes away. This is an attempt to reach those of you going through a similar circumstance, or for those who have a special friendship, and just want to smile and appreciate it all the more. The author takes you through various scenarios, both poignant and humorous, and a personal journey of loss, the aftermath, and the feelings from being “left behind.” It is all done with “heartfelt” words, and insightful situations, along with a faith-inspired belief. What happens when God is in control and how it prevails in everything you do changing the outcome of your everyday encounters. Passages encompass many scenarios of everyday life, with people from all walks of life. It details how God can change your life if you are willing to let him be in control. 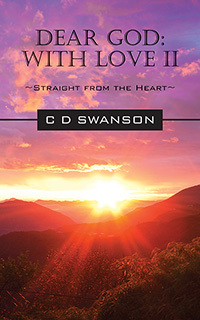 Faith inspired, as always is what led CD Swanson to compose this book, and to reveal how many people come to the Lord through various heart-wrenching circumstances. A Look at Everyday Life with God In Control and how it affects not only you, but those around you. Jesus said to Peter, “Feed my sheep.” As we go through each day, we should “feed” and meditate on the Word. In loving obedience to God, the author provides scripture passages for 40 days & 40 nights – accompanied by devotional thoughts. The result is soothing and joyful, allowing the reader to feel the love and peace of the Lord. The author expresses the importance of knowing God on an intimate level. An amazing transformation invariably takes place as one becomes closer to God. His word, His voice, and His love eventually are easier to understand, hear, and feel. God has a purpose and a plan for all of His children. CD Swanson explains her own personal transformation, and shares her love of God with the reader in a compelling and truthful way. A new life a new family and something to hide. The Chief is personally involved with Samantha Evans newest clients. The Chief’s Niece will enthrall and tease you, and have you guessing throughout the entire book. The newest clients of Dr. Evans are complex…and someone is hiding a significant part of their past. Emotions, tempers, and diabolical plans translate into a dynamic, powerful and unforgettable story. Love, faith and destiny will touch Sarah’s life in ways she can’t begin to fathom. Sarah’s life had been uneventful…until now. After regular business hours, Sarah goes to visit an orphan battling cancer. While ascending the stairs in the hospital, her life takes a dramatic turn when she encounters a man bleeding from a head wound. She immediately springs into action helping him, not realizing forthcoming consequences will ensue. Meanwhile, a deranged person is on the loose. His target, the homeless population. A socialite gets involved offering a significant reward for the person(s) leading to the arrest of the crazed individual. Sarah, the orphan, the socialite, the wounded man, and the homeless attacker have a story to tell. Three, of the five have secrets lurking in their hearts. The startling revelation will have paralyzing repercussions for those involved. Words that resonate, in a powerful and meaningful way. A love for God, is evident throughout the book, and will bring peace and joy to those who read it. The sincerity in which the author writes is palpable, and will touch many hearts. Simple, pure, and intense, this is a booklet that Christians will read over and over again. Dear God: With Love II is as reverent and hauntingly beautiful as the first Dear God: With Love. A collection of short faith-filled stories, mostly based on actual events. This book is comprised of short stories, some are true, some are based on Biblical accounts, and still others a form of prose. The inspirational pull will be obvious from the first to last story. Each story is unique in its content,and yet share one common denominator, the love of God and His influence in our lives. This eclectic mixture of stories and prose, comprise an authentic and touching journey within its pages, leaving the reader wanting more. Kim Larson’s life was anything but idyllic. Homeless and bullied, she has an epiphany which not only changes her path in life, but others as well. Kim Larson survived a wretched childhood, her mother’s death, and being bullied in school. 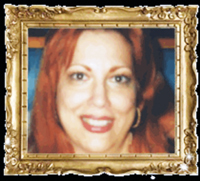 During a life-altering moment, she goes forward on a path of self-determination. Promising to make an impact upon graduation, she moves to a new state to implement her plan of choice. Many lives will be affected, and forever changed, when they come into contact with Kim, the girl who made it despite her prior circumstances. A devastating loss causes a man to think of other options as he faces life without his loved one. Immediately following his wife’s death, John, a CEO, makes a life changing decision that sets him on a new journey. With a grief-stricken heart, he attempts to “live” again, while holding onto memories of his one true love. Relocating to another State, having accepted a new job, he slowly adjusts to life without his wife. He struggles with guilt when he begins to experience feelings for his co-worker Kiana, who has suffered an equally devastating loss. Together, they navigate through uncharted waters, each with their own story and “ghosts” to deal with. Their story builds slowly culminating into an explosive and powerful climax. Jesus Christ, our Savior, the Messiah, the King of kings and Lord of lords. He came looking for us, and we love Him because He loved us first. The only begotten Son of God, our salvation, and our eternal friend. The Oasis, a beautiful place to “live.” Something is amiss in the scenic hills in which The Oasis sits atop. The residents want to live their lives, but there may be some rules to the contrary. Gemma Fields, the social worker employed at the Oasis, suspects foul play, and will not stop until she sheds light on the darkness that threatens to overtake the Oasis. With the help of two men, one a retired detective, the other an “attorney” an investigation begins. Will Gemma be able to save her beloved residents from the suffocating evil? God and His promises are still the same today. His words will never fade away. The grass withereth, and the flower fadeth, but the word of our God shall stand forever. (Isaiah 40:8 KJV) How much are we pleasing the Lord, during our day? Our actions, our thoughts, our deeds? A book dedicated to the praise and glory of His name and how we can please God both privately and publicly. Samples of everyday life, comments, testimony will bear witness to His love. A book Christians will welcome in their library. A Story Within A Story About Two Women From Entirely Different Generations. A story within a story involving two women from two different worlds and generations. Their connection begins the moment they meet, and ultimately progresses into a solid foundation which fundamentally alters the contemporary woman. Eve’s destiny, dangled in the balance, while she searched for employment. After yet another day of endless rejection, she was about to call it a day, and start anew in the morning. However, she felt compelled to knock on the door of a little church house. As the door opened, Eve had no idea how her life was about to transform in a powerful way. This story will touch your heart. As you read about the exciting characters, who unfold before your very eyes, it’ll seem as if you were right there witnessing the action. CD’s story is replete with romance, excitement, and intrigue, with an ending you didn’t see coming. Previous Previous post: Get a TRIPLE Bonus for the Month of July! Next Next post: Your Book Is Ready To Wear!